Claim Settlement Ratio is one of the most important Factor when buying a Life Insurance Policy. Insurance Regulatory Development Authority (IRDA) has released its annual report for financial the year 2013-2014. 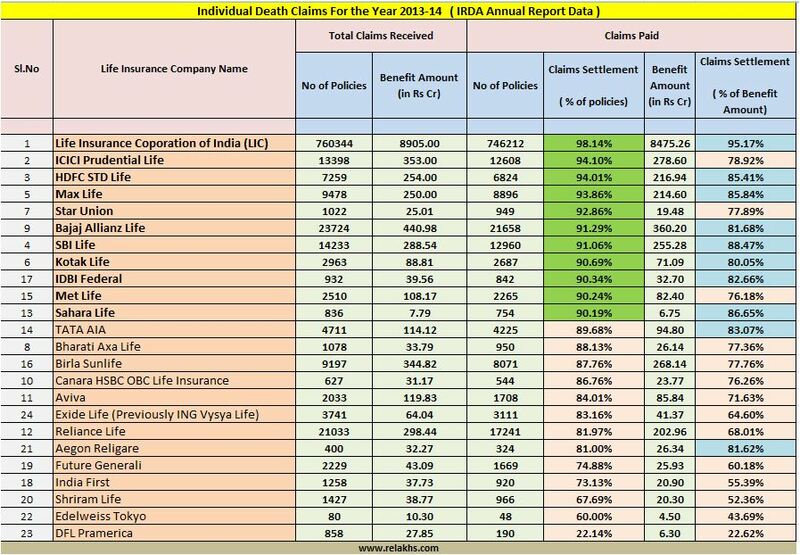 According to Annual report, LIC of India settled 746212 out of 760344 Claims which is 98.14% is the among all the Life Insurance companies, Its like LIC received 100 Claims and settled 98. In other senerio private insurer settled only 88.31%, which means they settled only 88 claims out of 100. Below is the attached annual report (2013-2014) of IRDA. Please refer to page number 13 of the below IRDA annual report. Here is the detailed report of claim settlement ratio of all the companies.